Police in the East Bay have issued a warning and are on high alert after six armed robberies in three days. The suspects are targeting people parked in their own driveways throughout Contra Costa County, police said. Authorities said it is unclear if the same suspects are behind all of the armed robberies that occurred in Orinda, Danville and Brentwood. All of the incidents occurred along the Highway 24 corridor. On Wednesday night, two armed men raced down Interstate 680 driving at more than 100 mph. The chase, which began in Danville, ended in Oakland with the suspects getting away. Police said prior to the pursuit the suspects held Valeri Hancock's neighbor at gun point and then carjacked a nearby vehicle. "I am stunned," Hancock said of the incident. "I am totally shocked because I consider this a very safe neighborhood." An armed robbery with a similar description was reported just hours earlier in Brentwood. Police said in that case two armed men held a 16-year-old girl at gun point in her driveway on Holly Oak Court. In total, authorities said there have been six armed robberies throughout Contra Costa County in a span of three days. All the victims have been robbed at gun point while sitting in their own cars and parked in their driveway at night. 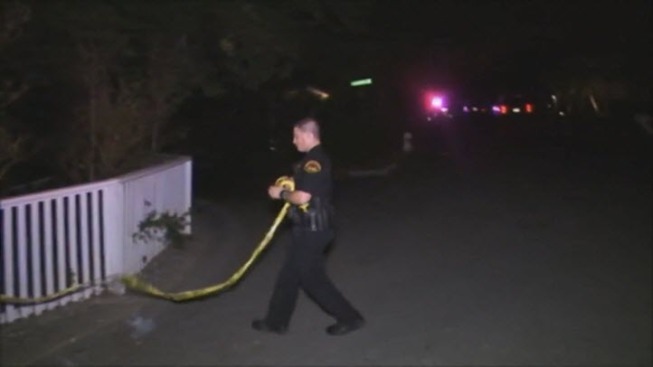 Authorities believe the first incident in the series occurred last Monday in Orinda when two armed suspects pistol-whipped a man and shot his wife. "It's alarming and it usually means there is a crew of individuals out there doing multiple robberies," Brentwood Police Sgt. Mark Misquez said. "And we work together with the other agencies to see if there is a link." The Contra Costa Sheriff's Office said suspects involved in the Danville incident were last seen in a white sedan with paper license plates. Authorities are urging people to be on alert, especially at night driving home. Police said if people see someone following them, drive to a public place and call police.